but we had each other,. as a very special mother’s day gift. they knew i loved flowers. and they did so fearlessly. and they didn’t worry about getting in trouble. and they hoped i wouldn’t be mad. understood why, and wouldn’t be mad. these flowers meant the world to me. and they were dirty and smiling and proud to have a gift. and i hugged them and was so happy to be their mother. and to all of their neighbors. and wish them a happy mother’s day. Very touching. To be taken to heart. Happy Mother’s Day. I received a similar gift from my girls when they were small. That memory is one I hold close to my heart! it is very special isn’t it deb ? What was special today was both girls disappeared and soon were back in the house each with some sprigs of lilacs they had picked from our bush, just like when they were young! Made me tear up—again! Beautiful Beth. Happy Mother’s Day! Happy Mother’s Day! Kids know when they have a great Mom. Yes. Beautiful little girls doing the right thing, certainly, under any arched eyebrows of neighbors. I hope you spend precious hours with the two stateside grown girls and grands today, and phone/skype time with the down under family, Beth. 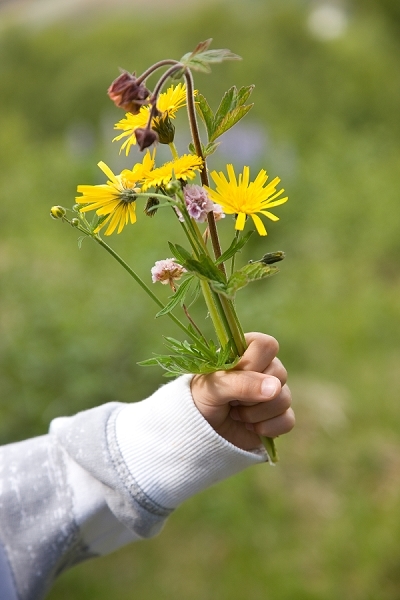 Flowers never more beautiful than in the hand of a child. So sweet! Hope you have a wonderful day! Lovely, Beth. It’s amazing, how giving a child’s heart can be sometimes. I hope you had a lovely Mom’s Day, Beth. Happy Mother’s Day, Beth 🙂 Even by only knowing you through WP and fb, I can see why your daughters are lucky to have you for a mom. lol, I got hand-picked weeds/flowers today, too. Was just going to get on my 11-year-old’s case about something she had said, then she comes in with the flowers. She got herself out of (another) lecture for sure. Hope your day was a good one! Thank you for the sweet post, beth. It made me smile. Gorgeous Beth, I love this story, it made me smile today thank you. Love this so much! It made me smile. Even though I have no kids. Can I just borrow yours? They sound nice. It also reminds me of that sweet song, “Even though we ain’t got money, I am so in love with you honey…” Those memories are treasures and the way you expressed it was so sweet, Beth!